Explanation: The Sun is a busy place. This false-color image depicts an active region near an edge of the Sun. 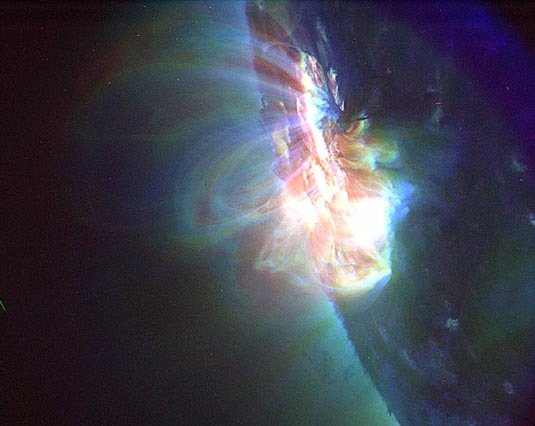 Hot plasma is seen exploding off the Sun's photosphere and traveling along loops defined by the Sun's magnetic field. The red regions are particularly hot, indicating that some magnetic field loops carry hotter gas than others. These active loops were so large that the Earth could easily fit under one. The TRACE satellite was launched in April with plans to continue high-resolution imaging as the Sun passes Solar Maximum in the next few years.